Well, Medellin isn’t the most dangerous city anymore for quiet some years. With its modern (and clean) metro, hip bars and restaurants and enough shops to choose from you almost can’t imagine it was totally different in the ’80’s and ’90’s. The city is booming and very welcoming to tourists. After all the tourists are a symbol that the city is doing great and is safe. Medellin feels saver than most people would think. And surprisingly Medellin is cheaper than cities like Cartagena or Santa Marta in the North of Colombia. But for the low budget backpackers here are some tips to see the city’s beauty without spending too much money. The metro system in Medellin is good. A one way ticket costs 2000 pesos ($0,66) and can bring you almost anywhere in the city. It is remarkably clean and even in rush hour, when the metro’s are cramped with people, everybody stays calm and relaxt. 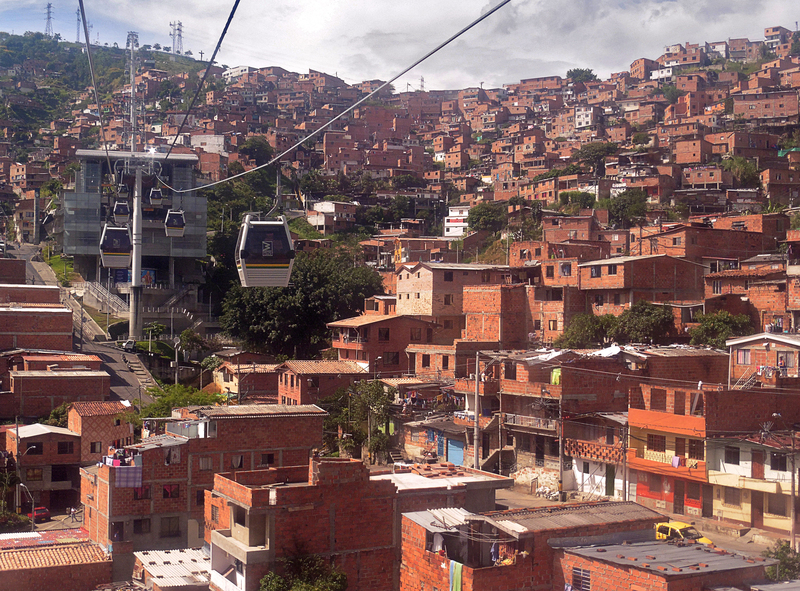 The Metrocable (Gondola lift) brings you to some of the least developed suburban areas. Believe me you want to take this ride. It lets you hover over the endless ’barrios’ of brick stone houses and you get to see an amazing view of the city. There are three lines: K, J and L. Line K and J are part of the metro system and with your metro ticket you can use them for free. Line J, which is connected to line K, brings you further up the mountain to Arvi park and coasts an additional 4000 pesos ($1,35). In Arvi Park you can hike for free without a guide. The temperature is cooler than down in the city, so bringing a thin sweater could be wise. Medellin is a green city with the Botanical Gardens as a highlight. There is no entrance fee and you can walk around as long as you want. It has more than 1,000 living species, 4,500 flowers and a small butterfly garden. It’s great to have a picknick or even a nap in the shade to escape the warmth in the middle of the day. You can easily reach the gardens by metro. Get out at station Universidad and from there it’s a couple of minutes walk. On top of Nutibarra Hill (Cerro Nutibarra) is a reproduction of a traditional Colombian town called Pueblito Paisa. One of the biggest tourists attractions, but don’t expect something big. You can enjoy the beautiful view, eat and drink a bit and walk around. You can walk up the hill or take a taxi up. In the centre of Medellin is The Parque de las Luces (park of lights) which was once one of the most dangerous places in the most dangerous city in the world. It was a place for homeles people, drug addicts, thiefs and other people you wanted to avoid. The Government turned it around by making it a safe place by providing social facilities for the homeless and drug addicts and gave the park a make over. There is not much green, mostly concrete (less comfortable to sleep on), but even thought an interesting place to check out. Mostly because of the bamboo trees where you can relax in the shade and the vertical ‘sticks’ divided over the park, which turn on as lights when it gets dark. 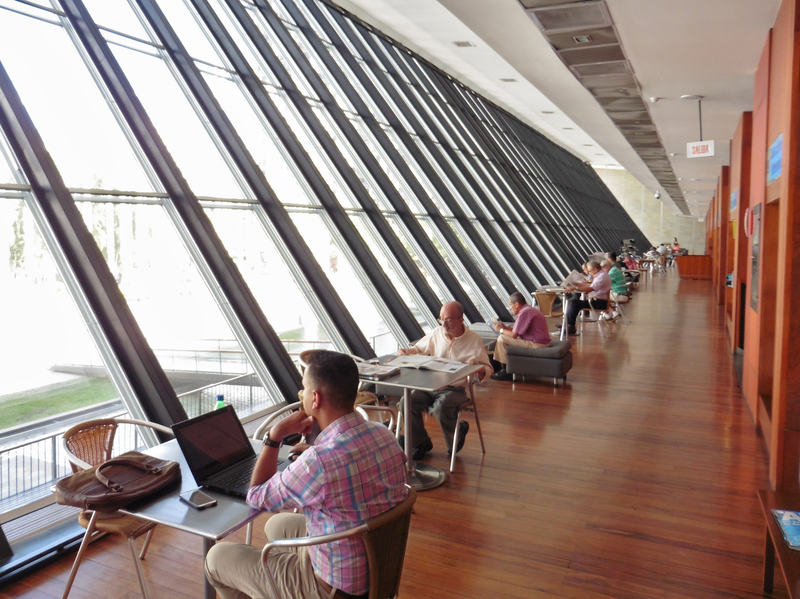 If you want to escape the noise of the city enter the big library on the park. The library mostly focus on technology, science and environment, but also offers art expositions like photography and illustrations. It is full of locals hanging out (in quietness), reading news papers or enjoying listening to music. A nice place to stroll around for a bit and the entrance is free. A big time favorite amongst tourists. The duration is four hours, but time flies during this tour. After four hours you can’t believe it’s over already. 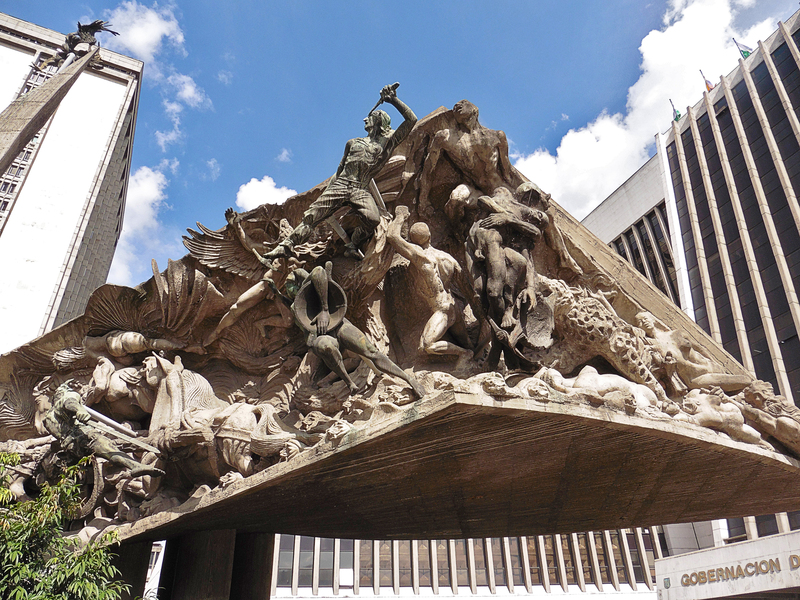 The tour is full of history, interesting facts and local tips about Colombia and Medellin. As the name suggests it’s for free, but it’s a fulltime job for the guides. So bring along money for tips in case you enjoyed the tour. The tour is populair and you have to book in advance via their website. Finding cheap food in Medellin is not hard, especially local food. But if you want to try something else than a lot of meat, try Salud Pan in Laureles or Antonio’s in Belén. Salad Pan offers raw food, vegetarian, meat and fish, all in day menu’s (fixed) ranging from 11.000 to 16.000 pesos ($3,60 – $5,30). Salad Pan offers one day menu, which is vegetarian and changes everyday. The menu costs 10.000 pesos ($3,30). As well at Salud Pan as Antonio’s the menu’s contains a soup, a main dish, small dessert and a juice. All delicious and healthy. 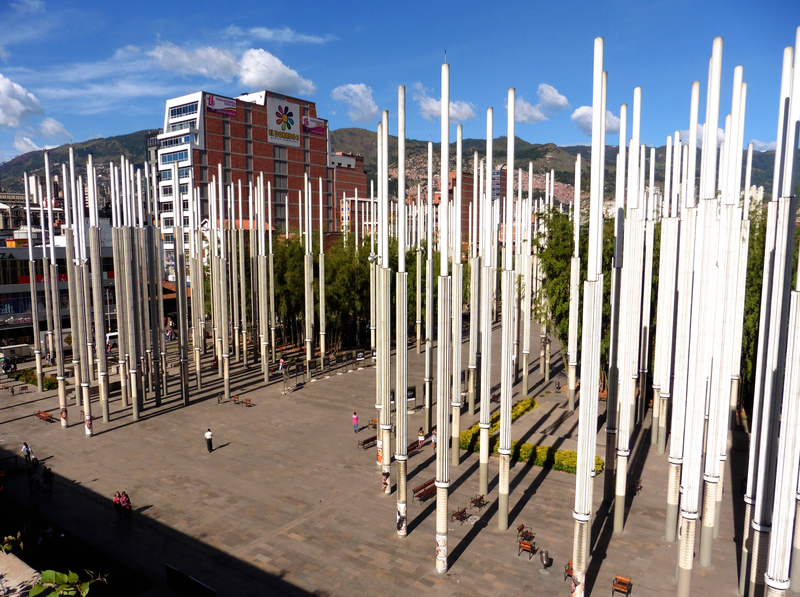 Medellin aims to be a healthy and athletic city. Out of the centre you will see a lot of people running, biking or rollerblading on the streets. If you don’t feel comfortable exercising between traffic, go to La Unidad Deportiva in Belén. An impressive and huge sport complex which offers soccer fields, basketball courts, a track, a pool, an archery range and outdoor gym. A lot of areas are free to use. If you want to stay longer in Medellin but don’t have the money to spend on hostels, consider volunteer work. A lot of hostels need volunteers and in exchange for a couple of hours work a day you can stay for free. If you’re really lucky you even get free food. Just email them in advance or walk in and ask. Medellin is a beautiful city. A lot of locals are not used to big groups of tourists, so don’t feel awkward when they stare at you a little bit. It is out of curiosity and they mean well. Even though the city feels safe, still use your common sense. Don’t walk alone on the streets late at night or flash your cash or phone to much (just like most places actually). But next to that Colombians are happy friendly people and you will feel welcome in their country.